I am going through my files today, recycling the old, making space for the new. 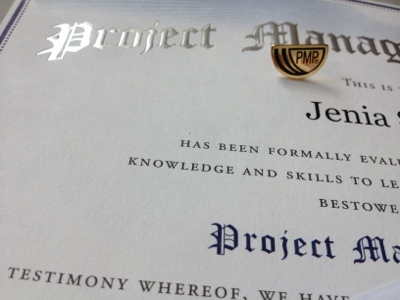 Priorities change: I put a lot of hours into getting my PMP credential four years ago, and now I let it lapse. Not looking back. The best project management experience comes from doing, not studying. Congratulations, many years too late. Do you regret letting it lapse? Thanks! No regrets. It was useful at its time, but now it’s time for other things. I did a lot of practice tests. Also Head First PMP by Oreilly books was quite helpful and had the right amount of helpful stuff, in my opinion.